This guide shows how to debug creatives in your apps using in-app preview. In-app preview lets you see your own creatives rendered within your mobile app. This preview is especially useful for publishers who have creatives that interact with the app, have unique behavior, or rely on the app for some of their rendering (including native creatives and MRAID). The Delivery Inspector gives information on which ads were delivered. When unexpected ads deliver, use the Delivery Inspector to find out why. // TODO: Replace YOUR_AD_UNIT_ID with your own ad unit ID. 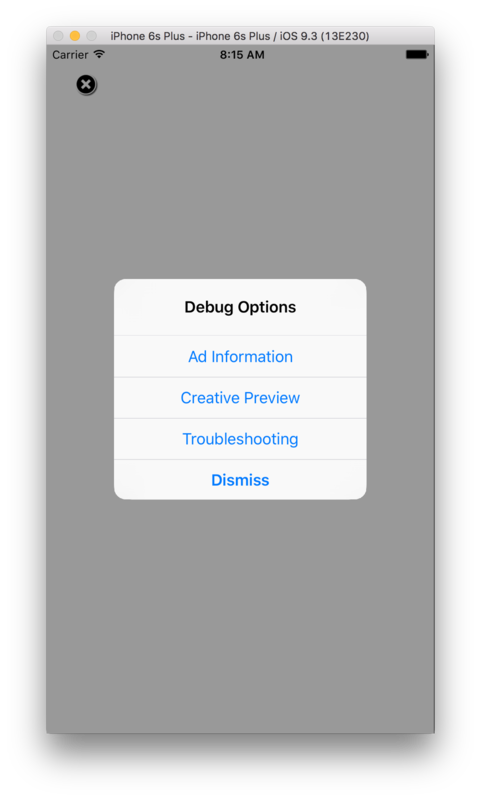 Any valid ad unit from your Ad Manager account is sufficient to open the debug options menu. 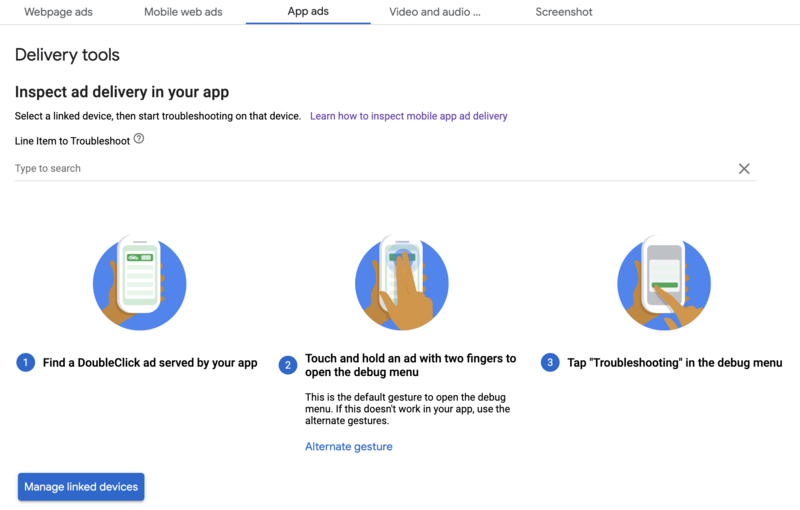 Note: Another way to open the menu is to do a swipe gesture on the creative, but it doesn't work for all ad formats such as native ads, and you must be careful to not click the ad when attempting to swipe. Calling the method above is much more robust. Select Creative Preview to link your device. A browser opens and automatically navigates you to a browser to log in to Ad Manager. After successfully logging in, name your device to register it with your Ad Manager account, and click Verify. Note: SFSafariViewController is opened on iOS 9 and above, while Safari is opened on iOS 8 and below. You have successfully linked your device! At this point, you can see your device linked in the Ad Manager front-end. You can also allow others to access your devices. Follow the steps to push a creative to your linked device. Make sure that the pushed creative is part of an active line item targeted to the ad slot where you want to see the creative. After pushing a creative from the front-end, trigger the debug options menu on your device again, and select Creative Preview again. 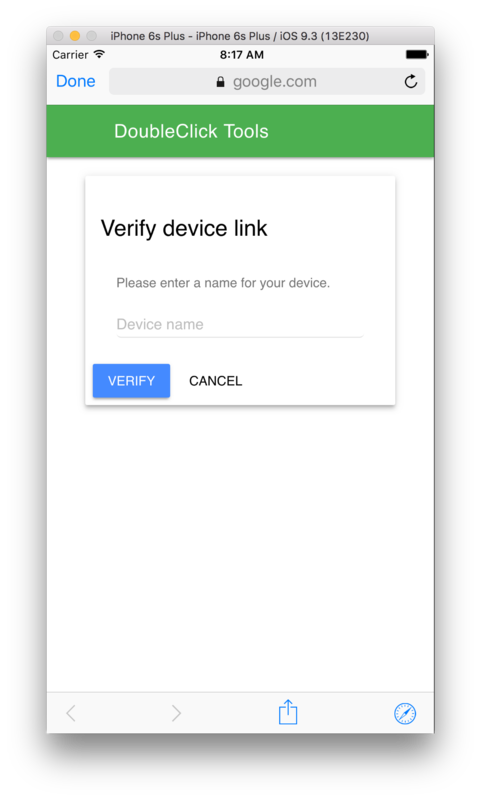 This step lets the SDK check Ad Manager again to verify that the device linking was successful and to get some information about which creative you pushed. If device linking was previously successful, the debug menu closes immediately. If it was unsuccessful, you're prompted to link your account again. Finally, load an ad for the slot you wish to preview to see your creative! Follow the Begin app troubleshooting steps to troubleshoot your app. If you complete the steps successfully, the request will show up in the Ad Manager frontend and you can view more info about the ad that served.